Christmas markets are everywhere in Tuscany! Continuing after our post from last week about Christmas in Florence, we’d like to point out a few markets in the region. From December 1, you’ll find a Christmas village and skating rink at La Lizza gardens. Starting December 8, you’ll find the Christmas market in Piazza Mazzini with lots of fun activities for the kids and for the family. Runs through December 26. On December 11 and 18, live the holiday cheer in the historical center of Marradi, high in the Appenines betwene Florence and Bologna. Handmade items perfect for gifts and Christmas decorations and more, music and shows for the little ones make these Sundays before Christmas special. On December 8, 11 and 18 Palazzuolo celebrates Advent Magic, a market in the small mountain town to celebrate the holiday season. Beautifully decorated streets with many gift ideas, you’ll follow each street surrounded with Christmas songs while admiring the various Crepe/Nativity scenes. Santa Clause will be present for the little ones. 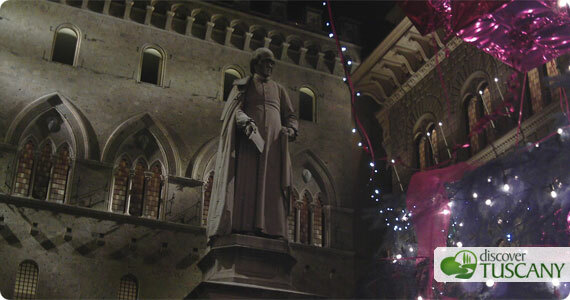 Taste traditional winter dishes and enjoy the street entertainment and lights. On Tuesday and Wednesday December 13 and 14, the medieval cloister of the Badia Fiesolona within the European Union Institute in San Domenico di Fiesole opens up its doors to showcase Christmas items, from handmade Christmas decorations to many gift ideas and jewelry. Many stands will showcase the craftsmanship of artisans from across Tuscany. A Christmas concert will take place Tuesday afternoon. From 3-9pm Tuesday, and 10am-6pm on Wednesday at Via dei Roccettini, 9 – Fiesole. AILO Christmas Bazaar: In the Pagliere near Porta Romana, the American-International League organizes a bazaar and lottery with all funds going to local non-profit organizations. Gifts, toys, house items, baked homemade cookies and other treats, books, Christmas decorations and so much more will be available. From 10am to 5pm.